OK. Those of you with a fancy rice cooker, or a rice cooking method that you’re completely satisfied with, skip down to today’s recipe – egg fried rice. For everyone else who struggles with cooking rice, or avoids it completely – gather round. A few months ago I wrote about time savers in the kitchen and it generated some lively discussion. One comment from the lovely Claire sparked some debate as to the best and quickest way to cook rice. Claire was an avid fan of the quick boil method, something I hadn’t used in ages. I decided to give it a test, a little rice experiment, alongside what I thought was my current preferred technique – the good old absorption method. So the other evening I cooked up two batches of fragrant basmati rice. For the absorption method I weighed out 250g basmati rice, rinsed it thoroughly under cold water until all the excess starch was gone. Popped it in a medium saucepan and added 500mL water. This was brought to the boil uncovered. The heat was then reduced to the lowest setting and covered tightly with a layer of foil and then the lid. It was left for 15minutes and then removed from the heat and allowed to stand for 5 minutes before fluffing with a fork. For the quick boil method I filled a medium saucepan with water and brought it to the boil. Then added 250g unwashed basmati rice and simmered for 10 minutes until it was only just tender and still with the faintest bight. It was then drained and the colander placed back in the saucepan to keep warm while we waited for the slow poke absorption rice. Our quick boil rice was the hands down winner in terms of fluffiness and texture. And it certainly lived up to its name in being the fastest of the two methods. We did notice that the flavour of the absorption rice was slightly stronger but this was probably a temperature related thing as the quick boil was not as hot when we tasted the two together. I now have a new favourite rice cooking method – it’s quick boil for me from now on. And I also tried out freezing rice for the first time at the suggestion of some readers. And I have to say it works like a charm and is so much cheaper than buying par cooked supermarket rice. So I’ll also be making extra rice next time I cook it and freezing for future dinners, like my current obsession – egg fried rice. I can’t believe how deliciously moreish this egg fried rice is. Even on its own it tastes far more complex than just egg, rice and soy sauce. And the best thing is that it’s the perfect blank canvas to build a meal around. Need some greens? Throw in a handful of frozen peas, or some chopped spring onion and you’re in business. Pretty much any veg will work, of course some will need to be cooked first. It would also be lovely as an accompaniment to a stir fry or even just some wilted greens tosses in oyster sauce. If you’re using frozen rice, best to defrost either in the microwave or just let it defrost naturally on the sink – it only takes half an hour or so until it can be broken up and added to the pan. I love basmati rice for this dish but feel free to use whatever rice you have on hand. Even brown rice would be lovely. If you are cooking rice freshly to make fried rice, be sure and spread it out on a tray and allow to cool for half an hour or so to give the starch a chance to be in the right frame of mind for some frying. Heat a wok or large frying pan over a medium high heat. Add about 2T peanut or other neutral oil and allow to heat. Add egg and toss for about 30 seconds so it starts to cook then add the rice and continue to stir fry until the rice is heated through and the egg is cooked. Stir through soy and taste. Add a little more if needed. Serve hot with the soy bottle at the ready. Helpful when someone does the side-by-side, thanks, Jules. Good news about the freezing as I always overestimate how much I need and I think fried rice needs “leftover” rice. Very interesting. I am hopeless cooking rice. I love my rice cooker, I loke how it is fire and forget. I have never think to the possibility of freezing cooked rice. It’s a wonderful idea! To cook rice I use a method similar to your absorption method…I use 160 g water and 100 g rice, I cook it 13 minutes at very low heat, then I turn off the heat, I put a cloth between the pan and the lid and let the rice rest for 13 minutes more. I’ve always used the absorption method. But my girlfriend’s mom only uses the quick boil method. As to the fact that the quick boil is fluffier, I think there’s always a point in the absorption method where the rice gets softer and heavier and starts to smush the rice on the bottom. In the quick boil method, it’s all loose, swimming around in the water like pasta. No smushing. Maybe the absorption method has a stronger flavor because in the quick boil, you drain a lot of the flavor away? I do the quick-boil and a quick saute with a bit of olive oil. Separates and fluffs. My grandmother, and mother, of Anglo-Indian origin, always instructed me to cook rice the absorption method. Growing up, my friends were always envious of the fluffy rice we had afor dinner, and not watery grains. Rinse (any amount) of rice (basmati, jasmine) under water and place in a medium saucepan. Cover with enough water, measuring up to the second joint of a (clean) index finger placed in the water resting on the surface of the rice. An old rule handed down from my grandmother. (I think it basically translates to the same amount of rice to the same amount of water). Cover with a lid, place on a medium-low heat and let the rice cook/absorb for 15-20mins. Never release the lid before 15min, as the steam will wooshi out! Once cooked (test a grain or two) place on a cool teatowel or sponge to let the base steam and loosen the bottom, and serve! I found your blog two days ago when I was searching for a simple recipe on how to make the best scrambled eggs, and came across the one about Tetsuya and creamed corn. Since then I’ve already tried five of your recipes, the favourites being the ricotta and basil frittata and the little Baileys cheesecakes. Thank you so much for opening my eyes to how amazing quick and simple meals can be. Just found your site by listening to an older Leo Babauta podcast. I love love love it and can’t wait to try this quick boil method for perfect rice! Glad to find you. Quick question about the Quick-Boil method… Have you tried it with brown rice and if so, should the time be adjusted? I’ve always used the absorption method, but am curious about trying this new quick-boil method, but we do a lot of brown rice. Thanks! I’ve experimented with different rice techniques and types of rice, and I find that the method’s success depends on the type of rice used. Basmati is definitely fluffier cooked by the quick boil method, but I find that brown rice is lighter when cooked via absorption. With brown rice (1 1/2 cups water to each cup of rice), I bring it to the boil then cover and cook for 30 minutes. Turn off then leave for 5 minutes before fluffing and turning out of the pan. I freeze rice – very handy for fried rice with lots of vegies. Last nights’s (brown) fried rice had onion, garlic, ginger, cubed eggplant, mushrooms, celery, fresh corn, steamed broccoli & cauli flowerets, peas, grated carrot and zucchini. Added soy and dashi powder, and stirred coriander and thai basil in at the end. Yum! Great texture and good leftovers. I am late to the party as usual, but I love this recipe. I haven’t cooked fried rice for ages but I will now. It is one of the ultimate simple meals. Personally I love it with broccoli and grated carrot. Easy. In addition to the beaten eggs, I always mix 1 extra raw beaten egg with the rice thoroughly, before frying, until it’s all covered nicely with the egg (but not too wet) and yellow in colour. The egg will slightly coat the grains, and kind of force them to separate. This way, I can make fried rice even with steaming hot rice fresh off the rice cooker (if I had no time, or too hungry). To pull this off, you’d need a very hot heat source (gas stove is best at home), very good wok, sufficient oil, and always keep the rice moving while frying. Is that supposed to read bite (the faintest bight)? I remember reading this post a few days ago and it saved me tonight! Traffic was terrible, so I was late getting home and the recipe I had in mind was going to take too long+I had leftover rice. I also had left over turkey slices which I diced up and threw in with the leftover rice with broccoli. Thanks for the great tips and keep the posts coming. I am really excited about the veggie bent as of late. Cheers! Yuuuummmm…. I’ll be giving this recipe a go. I’ve always used the absorption method – same measurements, but cooked for 12 mins, then a quick stir and lid back on to stand for 10 mins. Usually it’s light and fluffy… but have had the pan up too high on occasion and the bottom layer stuck (hate that). Always basmati too. But I am prepared to give the quick boil method a go after reading this. Two quick Q’s when you have time: 1. how do you re-heat your frozen portions? (pan / microwave?) 2. And do you need to a little water to prevent it being too dry upon re-heat? 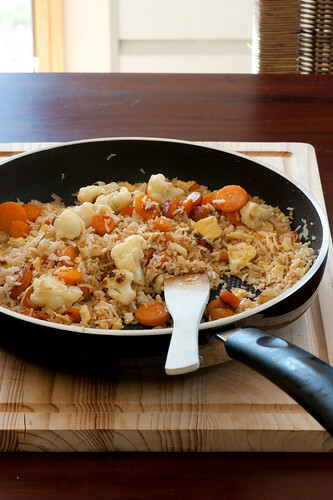 no extra water needed – as the rice warms up it’s all good – the oil in the stir fry helps as well. ronny – thanks for sharing – interesting idea to coat the rice in the egg first – will have to try it next time I don’t have time for my rice to cool down. great blog…love love love this. i am learning so much. barcelona here we come. Boiled rice *and* soya sauce in the fried rice? ugh. Both severe no-nos in the Middle Kingdom. May I add my small input here? Add a tbsp oil (not olive oil) and a dash of lemon juice (if you like) while cooking the rice. The oil helps to separate each grain and lemon juice adds a nice aroma, flavor and gives nice white color. Try jasmine rice sometime. It does works beautifully! par boiling the rice then steaming them makes a perfect fluffy rice. Not sure what’s wrong with soy sauce and boiled rice in fried rice. 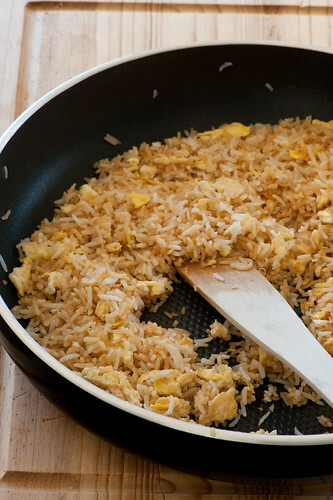 This is exactly how my Filipina mom makes fried rice (well, she always adds garlic, too). here’s my 2 cents worth: add in soy sauce to your eggs before you beat them. this ensures that the flavour is evenly distributed throughout each grain. how much though, is completely up to your personal preference. it also prevents the rice from absorbing the sauce instantly while you’re adding it to flavour. and yes, like marni’s mom, i love to sauté some garlic before adding in my rice. Hi, love this recipe! Claire’s ginger / garlic suggestion worked really well for us. i desperately want to make this my magical method too. could you please provide more details about the exact amount of water to use in the quick boil method? or is this formula so magical that the amount of water to boil is irrelevant? many thanks (looking forward to subscribing). yep – the amount of water isn’t critical – as long as it isn’t going to boil dry you’ll be fine. Just a late addendum to post…..
Not rinsing the rice before or after cooking (as per your boil method) retains more nutrients than rinsing. (info from Sunrice). One more plus in my opinion! 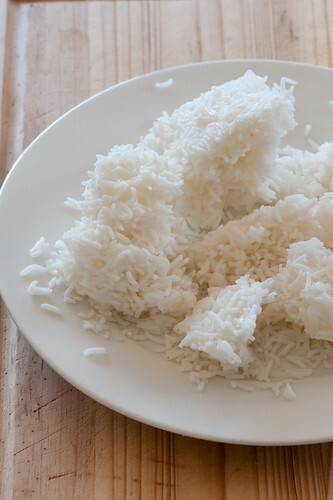 Really good blog with some sensible and easy to follow advice about making perfect rice. This is really good and the sort of thing that I hope to promote, so thank you very much and well done! Saw a TV programme a couple of years ago which blind tested different methods of cooking rice and the panel of chefs voted unanimously for the oven method. One measure rice (washed or unwashed according to preference) to 2 measures boiling water (eg 1 cup rice and 2 cups boiling water). Use dish with a lid and cook in preheated oven at 200c for 20 minutes. Works every time. Especially good method to use if oven on anyway. Fried rice makes the BEST leftovers – I’m definitely cooking some rice tonight, frying it tomorrow morning, and taking it to work tomorrow. Yummy! I always add a lot of spices as well – whatever I think will taste good. Chili powder and paprika always work! I’m excited to try it next. The secret to making the best rice is using pure natural clay pot. Unlike in metals, there’s no need to boil water before adding rice/ grains. The grains & water can be added at the same time. Your rice will get cooked beautifully even before the water can come to a full boil.For the sake of your health, we recommend cooking rice that has been processed the least, with no additives and more importantly no arsenic. What can be used for egg fried rice besides soy sauce. I have Alzheimer’s in my family and need to avoid all soy. Also. Can you dehydrate cooked rice? I usually cook some and keep in frig to reheat so that there is more Resisrant Starch. That works for potatoes too. Rinsed It twice and soak for 1 hr.then cook it for your favorite recipes. Being out on my own means that I need to cook for myself now, and I need a little help with that. It’s good to know that when it comes to cooking with rice, that there are somethings that need to be remembered to make sure that it is made right. I like how you made the suggestion that it might be a good idea to rinse it under cold water until all the excess starch is gone before cooking. This is something that I will have to try so that I can get fluffy rice. Let me know how you get on with the rice Harper!